The Regional Holocaust and Genocide Initiative: Resistance, Resilience and Responsibility, will welcome Samuel Totten to Syracuse University on Feb. 9 and 10, to participate in a series of lectures and workshops on the Holocaust and present-day genocides. On Feb. 9 at 9:30 a.m., Totten will meet with faculty from the School of Education to discuss his experience in Sudan, from where he has just returned from a semester conducting interviews with refugees from Darfur and the genocide perpetrators in the Nuba Mountains. At noon on Feb. 9, Totten will present “The Origins and Prevention of Genocide: Methods in the Study of Mass Murder in Rwanda and Darfur.” This lecture will take place in 220 Eggers Hall and is open to the public. It is co-sponsored by the Program for the Advancement of Research on Conflict and Collaboration (PARCC) at the Maxwell School. At 4 p.m. on Feb. 9, Totten will lecture at Le Moyne College, in Reilly Hall. His presentation, “From the Holocaust to Darfur: Never Again; and the Recurrent Theme of Genocide in Contemporary Society” is open to the public. On the morning of Feb. 10, Totten will visit Westhill High School to lead a talk on “Contemporary Genocide: What Students Need to Know and Can Do.” On Feb. 10 at 3:30 p.m., Totten will lead a workshop for area teachers at the Winnick Hillel Center for Jewish Life on “Teaching about Genocide: Challenges and Opportunities.” To register, call (315) 443-4696. Totten earned master’s and doctoral degrees at Teachers College, Columbia University. He has taught at the University of Arkansas, Fayetteville since 1987. In addition to teaching in the middle-level master of arts program, he is also the director of the Northwest Arkansas Writing Project, an affiliate of the National Writing Project (University of California, Berkeley). 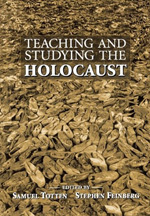 Totten is also a member of the Council of the Institute on the Holocaust and Genocide (Jerusalem), and the Centre for Genocide Studies (Sydney, Australia). He is the recipient of numerous teaching and research awards. During the summer of 2004, Totten served as one of the 24 investigators with the U.S. State Department’s Atrocities Documentation Project interviewing black African refugees along the Chad/Sudan border in order to collect data for the express purpose of ascertaining whether genocide had been perpetrated in Darfur. Totten is co-founding editor of Genocide Studies and Prevention: An International Journal (University of Toronto Press) and has served as a co-editor from 2005 to the present. He is also a co-editor of the Journal of African Conflicts and Peace Studies (Centre for Conflict Management, National University of Rwanda).